Indian star tortoise Geochelone elegans, copyright P. G. Palmer. As a whole group, the 'true' tortoises of the family Testudinidae are easily recognised, with a usually terrestrial habitus (though at least one species, the serrated hinge-back tortoise Kinixys erosa, is a capable swimmer), columnar legs with short heavy-clawed feet, and a relatively high carapace. But relationships within the tortoises have seen a bit of shuffling around in recent years, and nowhere has that shuffling been more obvious than in the genus Geochelone. Many of you may know Geochelone as the genus including the giant tortoises of the Galapagos Islands and islands in the Indian Ocean, as well as species such as the radiated tortoise G. radiata of Madagascar and the geometric tortoise G. geometrica of South Africa. At its broadest, about half the world's tortoise species have been included in Geochelone. However, the genus has always been poorly defined, marked by its 'primitive' skull (Gerlach 2001), and the lack of features of other tortoise genera such as the plastral hinge of the Palaearctic Testudo species, or the rear-carapace hinge of African Kinixys species. For the most part, Geochelone was simply a home for the bigger tortoises. Burmese star tortoise Geochelone platynota, copyright Kalyar Platt. So it is hardly surprising that phylogenetic studies, whether morphological (Gerlach 2001) or molecular (Fritz & Bininda-Emonds 2007), have failed to support a broad Geochelone as a monophyletic group. As a result, recent authors have advocated recognising a number of separate genera: the Galapagos tortoises belong to the genus Chelonoidis, the Seychelles giant tortoises to Aldabrachelys (as confirmed by ICZN 2013), the radiated tortoise to Astrochelys and the geometric tortose to Psammobates. From being the largest recognised tortoise genus, Geochelone has been cut down to a mere two or three species. These are the Indian star tortoise Geochelone elegans, the Burmese star tortoise G. platynota, and, maybe, the African spurred tortoise G. sulcata. The Indian and Burmese star tortoises are two very similar species that get their names from their colour pattern, with radiating star-like markings on the carapace. The individual scutes of the carapace bulge outwards, giving the animal an overall lumpy appearance. They are both medium-sized tortoises, growing to over 30 cm in length. 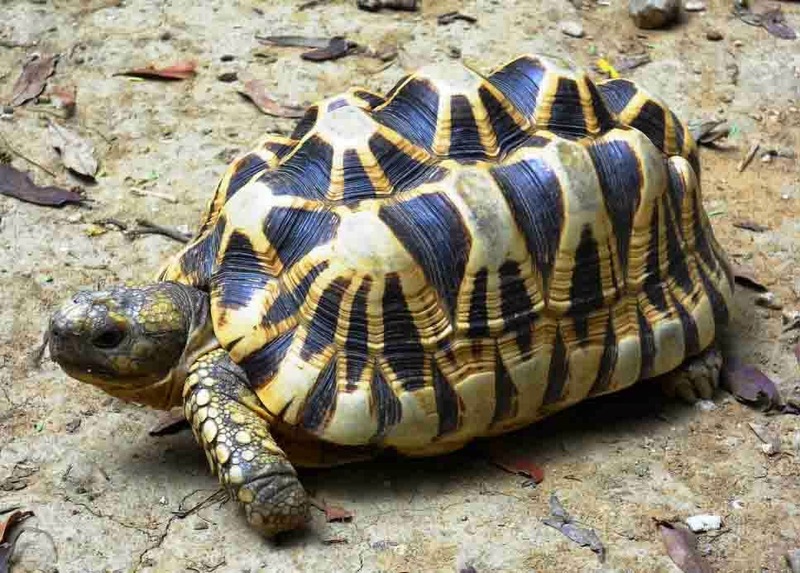 The Indian star tortoise Geochelone elegans is widespread in dry habitats in India, Pakistan and Sri Lanka, though conservation concerns have been raised about the extent of harvesting of wild tortoises for food and the exotic pet trade. The Burmese star tortoise G. platynota, on the other hand, is critically endangered, having been almost wiped out from its original range in the central dry zone of Burma. As long ago as 1863, Edward Blyth (who, offhand, sported one heck of an impressive beard) was complaining that specimens were difficult to find due to the local people's fondness for eating them (Platt et al. 2011). African spurred tortoise Geochelone sulcata, copyright Chris Mattison. The African spurred tortoise Geochelone sulcata is found across the southern part of the Sahara Desert and the Sahel. It is a particularly large tortoise, growing to over 80 cm (Swingland & Klemens 1989); in fact, it is the largest tortoise that is not found on oceanic islands. Spurred tortoises dig burrows that can reach up to 3.5 m in length in which to avoid the full heat of the day. This species is placed by some authors in its own genus Centrochelys, cutting Geochelone down to just the two Asian star tortoises. 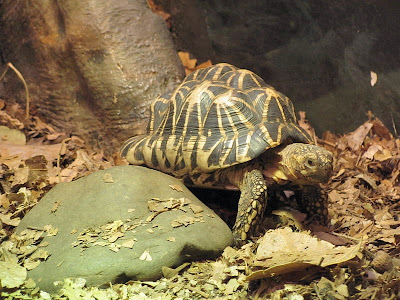 Molecular studies place G. sulcata as the sister taxon to the Asian species (Fritz & Bininda-Emonds 2007), but they have not been associated in morphological studies. 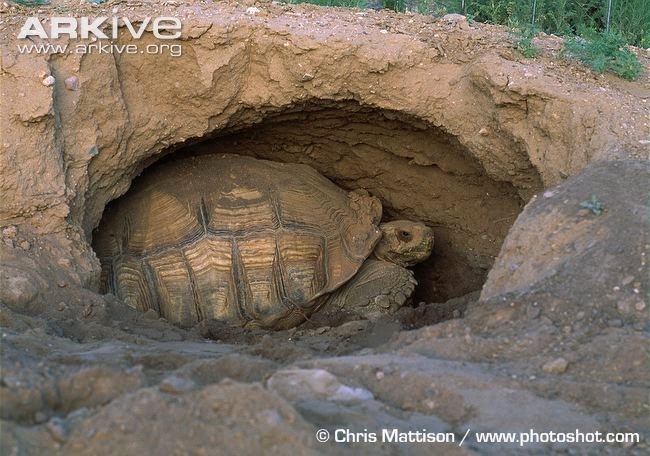 Though widespread, the African spurred tortoise is regarded as vulnerable due to the degradation of its habitat. Concern has also been raised, again, about the collection of wild individuals for the pet trade. Fritz, U., & O. R. P. Bininda-Emonds. 2007. When genes meet nomenclature: tortoise phylogeny and the shifting generic concepts of Testudo and Geochelone. Zoology 110: 298-307. Gerlach, J. 2001. Tortoise phylogeny and the ‘Geochelone’ problem. Phelsuma 9 (Supplement A): 1-24. ICZN. 2013. Opinion 2316: Testudo gigantea Schweigger, 1812 (currently Geochelone (Aldabrachelys) gigantea; Reptilia, Testudines): usage of the specific name conserved by maintenance of a designated neotype, and suppression of Testudo dussumieri Gray, 1831 (currently Dipsochelys dussumieri). Bulletin of Zoological Nomenclature 70 (1): 61-65. Platt, S. G., T. Swe, W. K. Ko, K. Platt, K. M. Myo, T. R. Rainwater & D. Emmett. 2011. Geochelone platynota (Blyth 1863)—Burmese star tortoise, kye leik. Chelonian Research Monographs 5: 057.1-057.9. Swingland, I. R., & M. W. Klemens (eds). 1989. The conservation biology of tortoises. Occasional Papers of the IUCN Species Survival Commission 5. Are the lengths quoted total lengths, carapace lengths, SVLs, or something else? They're at least carapace length.